When I was in high school there was a girl who, although somewhat over weight, was very popular with the boys. Her name was Pat, and although I never dated her, I heard she was a wonderful dancer. It seems even though a little heavy around the waist, she was light on her feet, and made a great dancing partner. Looking at the Huey helicopter on the ramp, I thought “How ungainly she looks!” but many years ago I knew how to dance with this particular fat girl. The Huey was born in 1956; the Army tried to call her a HU-1 Iroquois. The ‘HU’ stood for Helicopter Utility, and all American military helicopters are named after a tribe. However, the letters ‘HU-1’ were quickly contracted to ‘Huey,’ even after the D.O.D. standard designation system changed the designation to UH-1 (Utility Helicopter). Neither designation nor the name ‘Iroquoisî stuck, and she was ‘Hueyî for life. Over 9,000 Hueys were built in Fort Worth Texas and various places like China and Italy. 5,000 plus served in Viet Nam. In 1968 I attended Army Rotary Wing Flight School. When I first learned to fly the Huey, she seemed to me to be big and large around the middle, but when I did my part, she was light on her feet. We flew B and D models in flight school and in Viet Nam we had the H and C models. After flying the much smaller Hughes TH-55 (or, as we called it the ‘Mattel Messersmitt’) the Huey was big and intimidating. As I started flight school, class 69A1, it was evident that Viet Nam was going down as the first Helicopter War. At Fort Walters the only Hueys on post were those of the post medivac. I didnít fly Hueys until attending advanced training at Hunter Army Airfield in Savanna Georgia. Shirley and I had been married about a year when we arrived at Hunter AAF. We lived off post on Tybee Island or as the locals called it Savanna Beach.The Army had several thousand Hueys in service and was pumping out new Hueys faster than the Army was graduating Helicopter Pilots. My training at Hunter AAF consisted of instrument and tactics while flying the UH-1 D model. This included flying Army Ranger candidates on their first helicopter ride. Finishing school consisted of gunnery training flying the UH-1 B, shooting rockets and firing the mini-gun. I had less than 100 hours flying the Huey and was on my way to Viet Nam. In the next 12 months I would learn to dance with the fat girl! 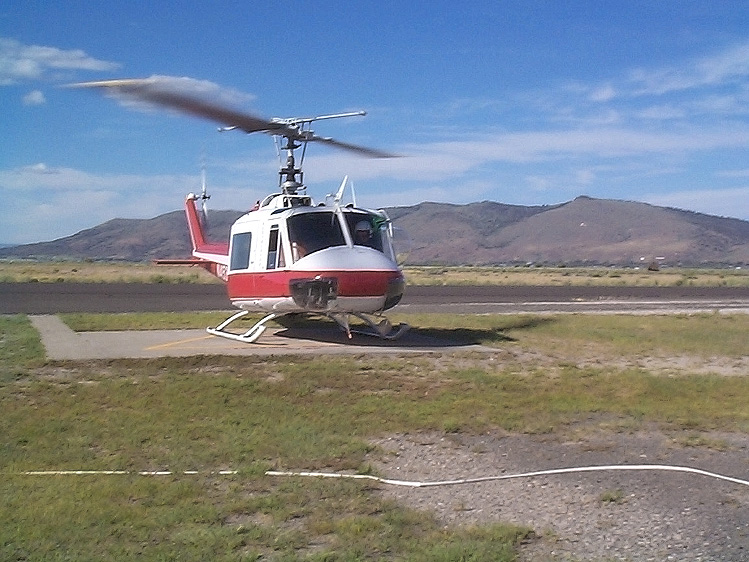 Thirty plus years later, sitting on the Ramp at Boise Idaho, is the civilian version of the Huey, the Bell Helicopter 205. She has changed little, the engine is now up to 1800 HP, compared to the H model Huey which was 1400 HP. If you look closely you notice the tail rotor has moved over to the right side of the tail boom. Sitting next to the BH205 is an Army surplus UH-1H. Flying as a restricted aircraft she can only carry external loads on the fires. The H model has been upgraded with a Cobra engine and tractor tail rotor. A closer examination of one of Idaho Helicopters H model shows signs of repaired battle damage; i.e., bullet hole patches. One of the H models served in the Delta with me and was assigned to the Tigers in Soc Trang. Both the fat girl and I have been busy these past thirty years, but Iím happy to meet her again. We both have had long flying careers and Iím old enough to know that her beauty lies deeper than her metallic skin and wide body. A-Stars and Long Rangers are pretty, but this is something different. However, unlike the situation in high school, this time the shoe is on the other foot. For the next three weeks I will take written tests, FFA flight tests, and OAS flight checks to see if Iím qualified to dance with the fat girl, and Iím looking forward to our first song; I mean, fire.